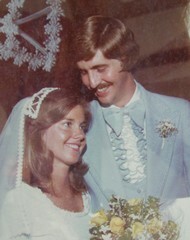 Thirty-five years ago today (July 17th) my beautiful bride to be “pledged her troth” to me. To a recovering hayseed that sounded mildly naughty but I learned it meant that she promised her fidelity to our relationship. She meant it. Today we celebrate well over three decades together. Hard to believe. Just for grins I went back and took a look at some of the top music in the year we got married. There were some hits that did not make the cut for the solo at our modest wedding. For example, Paul Simon’s “50 Ways To Leave Your Lover” was axed. Go figure. Joni rejected The Captain and Tenille’s moving rendition of “Muskrat Love” without allowing debate. I felt like Queen’s “Bohemian Rhapsody” would be a great crowd warmup. Rejected. “Shake Your Booty” by KC and The Sunshine Band was summarily dismissed. But one song from 1976 that was not wedding solo worthy still describes how I feel about the lovely Mrs.Burchett. Orleans had a hit with the song “Still the One” and the lyrics describe exactly how I feel thirty three years after exchanging our vows. I thought of the journey that Joni and I have traveled. I am fortunate in one thing. I married my trophy wife first and saved the hassle. But when our wedding pictures are dragged out I have to laugh. There I am with bad 70’s hair and my baby blue Dumb and Dumber tuxedo. And there is Joni looking gorgeous with her beautiful blue eyes and infectious smile. The reaction is the same for nearly every person who views those photos. A thought bubble rises over their heads with the question…”What was she thinking?”. I have no idea. I am sure she has asked the same thing. But she has hung in with me and trusted God. She has never tried to change who I am but she has always challenged me to develop my unique design in partnership with the God who loves me. She has prayed for me and our boys more than I can even comprehend. When our marriage monitor flat lined a few years ago she did not give up. It is a mystery. I am grateful for the journey. I am grateful for the potholes and the detours and the times of smooth traveling. I am grateful I chose not to exit or turn around when the journey got tough. We exchanged very inexpensive rings as a symbol of our commitment to each other on that July day in Florida. There is another symbol that I cherish. It is called the Cross. And I would suggest that what happened there is perhaps the biggest reason that Joni and I are still together in this mysterious and wonderful journey. Love it. Great post brother. Funny in eternity we will have probably the opposite thought bubble when we look at the bride of Christ and think what was Christ thinking? We definatley got the better end of the deal!!!! AMEN AMEN thank you for your grace Heavenly Father! Thanks for these words. What a great expression of honor to Joni. Thank God for couples like you and Joni who demonstrate real, genuine commitment and love for decades and don’t quite no matter what. Great stuff as usual, Dave. Happy Anniversary! Us young folks take notice and are inspired by the example of a Godly couple staying faithful and committed to each other for the long haul.